A startling new chapbook from Sam Kinchin-Smith. 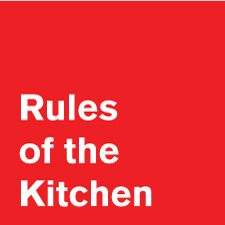 Audacious, shocking, funny and fresh, 'Rules of the Kitchen' may change the way you look at the domestic forever. From threesomes in Southwold to Othello's Rodrigo and addressing an iPod Sam Kinchin-Smith captures what poetry can do for us for now. It is a welcome addition to the Silkworms Ink poetry collection and certainly one to keep an eye on in the future.